So you've got yourself a modern, professional-looking ecommerce website and you're ready to start selling your products online. There's just one problem - you don't have any customers yet! Promotions - such as a seasonal sale or site-wide price reduction - can be a quick and easy way to generate interest in your brand and products. If users get a good deal, they will be more likely to tell their friends about it, and and if the product exceeds expectations then the customer may even return and purchase something else after the promotion has ended. Blogging can be a very cost-effective way to drive more traffic to your website. Not only can blog posts be used to highlight new products and special offers, they can also rank for popular search terms and hugely increase your brand's visibility in the Google results. Try to identify common questions within your industry, then write blog posts that answer them - you'll be amazed at how much organic search traffic a well-written, informative blog post can generate. Platforms such as Instagram, Facebook and Twitter offer businesses a near-limitless amount of opportunities to reach new customers. You can start a simple social media campaign by posting appealing content and linking it back to your ecommerce website - this method of promotion is completely free, and can draw in a lot of potential customers if you take the time to build your audience and consistently publish engaging, relevant content. An SEO strategy is an important consideration for any website, but ecommerce websites especially - every category page and every product on your website is another chance to get seen in the Google search results. Ideally, each page on your website should target a different keyword (or set of keywords) that is specifically relevant to that page and that page alone. This will help Google and other search engines to work out which page to show for any given search term. Some ecommerce websites do reasonably well without spending a penny on paid advertising, but platforms like Google Ads and Bing Ads can make a huge difference if you're looking to get your brand in front of a wider audience. PPC (pay-per-click) advertising only costs money when people actually click through to your website, meaning that you won't be charged unless your adverts are generating traffic. Of course, you'll have to work hard to make sure that your website is converting as much of that traffic as possible into actual custom for your business! Reaching out to bloggers and other influential people within your market is a great way to spread the word about your business quickly! The best approach will depend on the nature of the products/services you offer, but you might consider sending out some products for people to review, or inviting a popular vlogger to visit your premises for a video. Try to choose personalities who already have a large online following, and bear in mind that some may charge a fee for promoting your brand. Here at Designer Websites, we specialise in ecommerce website design as well as search engine optimisation, PPC advertising, blog writing, and a variety of other techniques that can help you to grow your customer base. Use the links below to find out more about our services. 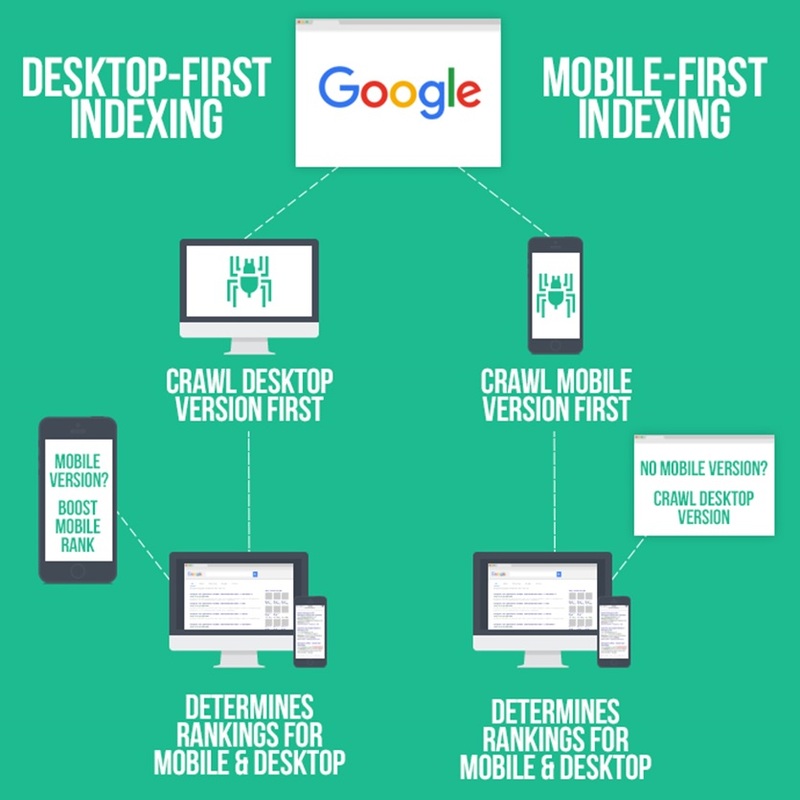 What is Mobile-First Indexing & How Does It Work? In March 2018, Google announced that they were starting to migrate their crawling method over to mobile-first indexing. What this means is that Google is beginning to use mobile versions of websites for indexing and ranking, where previously they prioritised the desktop version of a site. The switch to mobile-first indexing represents a reversal in the way Google approaches website content. A majority of web traffic now comes from mobile devices, and it's encouraging to see Google responding to this shift and striving to make everyone's browsing experience as enjoyable as possible. How will mobile-first indexing affect my website? Google's announcement indicated that websites won't be removed from the index just because they are not mobile friendly. However, Google will generally prioritise mobile-friendly websites in their results if the user is searching on a mobile device. We anticipate that desktop-only sites will lose organic search traffic as more and more Internet users shift away from PCs and towards smartphones. If you have a responsive website, you shouldn't have to take any action - Google will recognise that your site is mobile friendly and continue to show it in search results. If you do not have a responsive website, we would encourage you to switch to a more mobile-friendly design. At Designer Websites, we specialise in responsive websites that load quickly and function perfectly across all devices, providing an outstanding experience for desktop and mobile users alike. Jobs in the IT sector have grown at almost twice the rate of jobs in other industries in the UK. Access Training Academies, a long-time client of ours, is passionate about helping people to retrain and pursue exciting new careers, and they recently asked us to create a website dedicated to promoting a new selection of IT training courses. Why did Access Training Academies come to us? We have worked with Access Training Academies before – their main website, which was also created by Designer Websites, offers training courses in trades such as plumbing and plastering. We were thrilled when they asked us to work with them again on their latest exciting venture. We made Access Training Academies’ IT site mobile friendly so that users can check out these exciting IT courses with ease even when they’re on the go. In addition to the design and development of the site, we also optimised the website to rank well on search engines like Google and Bing. If you need a professional website for your business, please get in touch with the Designer Websites Team. Request a free, no-obligation quote for your project here.